After renting the Drive Medical DV8 Aluminum Steerable Knee Walker as an alternative to crutches, I was pleasantly surprise at how well this crutch substitute fit my needs. Per doctor’s protocol, I was to be non weight bearing on my ankle and foot for multiple weeks. Crutches did not seem suitable for my lifestyle, as I live an very active life and I need to cover large distances while working my job, and need to be ambulatory. Although the Drive unit did have some downsides, overall there were many positive aspects of this experience, and contributed to my overall satisfaction with the product. Overall Drive Medical DV8 aluminum steerable knee walker is extremely durable and surprisingly lighter weight than it looks. The lightweight is probably contributed to the aluminum material. However, I am a small person, I have seen this knee walker be able to hold body types that are much larger than myself, and do so well. Although I did find that the wears and seat cover tended to show wear much more quickly than the rest of the product. Very quickly, the padded seat began to crack, and the tread on the wheels became worn. The wheels were also not made to be on any unstable surfaces such as grass, asphalt, or tile. Unstable surfaces made for a very bumpy ride, and put a risk for falling over. I also noticed that some preassembled aspects of this knee walker were of poor quality. Requiring some added work to retighten screws and bolts from time to time. However, this was a simple task. Ultimately, this aspect did not change my overall option of the product. But, made me a little nervous for the safety of the product if they were not checked occasionally. 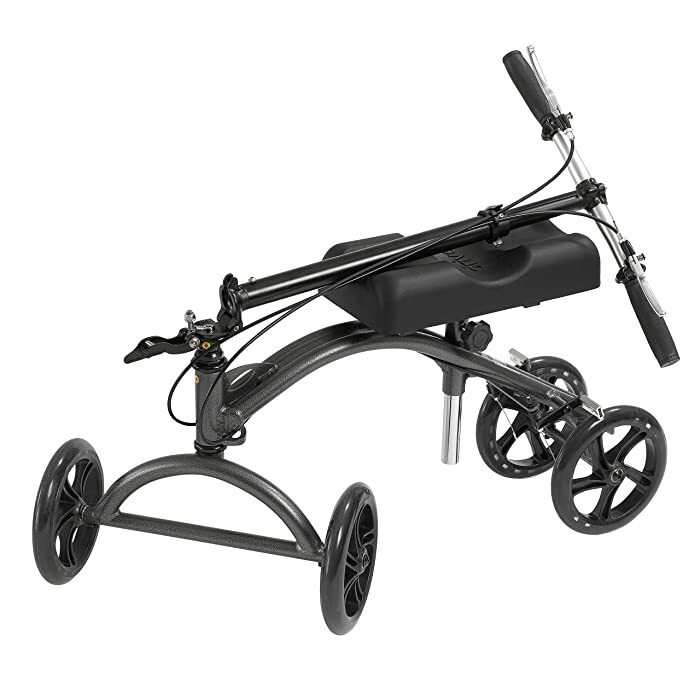 Drive Medical DV8 aluminum steerable knee walker was accessible in multiple ways. Not only was it very easily accessible for me to get a hold of. But, this product made aspects of my life much more accessible. It came with me pretty much everywhere, thanks to the folding handle bar feature, which allowed it to easily be place in a car. Although, this product did require some help from time to time while transporting. The handle bar does fold down, but this is a very bulky product. And, can be very difficult and tricky for someone with an injured ankle. This product is for the most part slim, and easily fit into doors, and most areas of my house. However, I did find that it wasn’t always reasonable to bring the knee walker into small spaces. The turning ability was also not as tight as it could have been while working around tight corners and small spaces. Due to this, traditional crutches ended up being the more realistic approach. Although, this product was amazing at assisting me cover large distances such as crossing streets, and while shopping at large stores such as the grocery store. I would have never been able to function during these times if I were left to use crutches. The one major inconvenience was the inability to use stairs while using this product. It was not realistic for myself to carry the product up multiple stairs if I did not have access to an elevator. Therefore, if I did need to go up the stairs, and did not have a second method for ambulation, I was stuck unable to use the stairs. Thanks to the folding handle bar feature, which allowed it to easily be place in a car. Overall, this product provided excellent features. The adjustable handle bar made it easy to find the proper fit for my height. Also, the adjustable seat also made it easy to keep my hips align while using the product. The multiple seat had groves that went two directions. Surprisingly, these were used more than expected. The first direction was perfect for resting my leg in while using the product. It provided stability, and comfort. I was not afraid my injured ankle would fall from the knee walker. The second direction, was the most surprise. I was able to turn the knee walker in multiple directions for standing at counters, or getting out of the shower. Normally, the handle bars would have been somewhat of an obstruction. This made life so much easier, without worry I would hit the handle bars, or fall over due to not being able to use the knee walker. The breaks also provided security and safety. 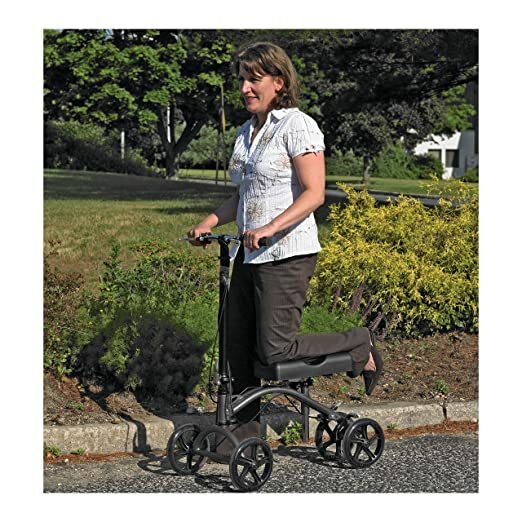 I was able to safely slow myself down while using the knee walker without any worry. Multiple other features such as baskets, pockets, and pad covers were available for this product. At first, I did not consider purchasing any additional features. But, reconsidered and bought a basket for the front of the handle bar to help assist in carrying items. The biggest complaint regarding the features, was the Drive logo which was located on this seat. This left an impression on the leg, and became quite irritating after some time. On the note of the padded seat, it did tend to twist slightly, coming out of alignment of the wheels and handle bar. Ultimately, did not make any difference on the function of the product. However, the complaints are few and far between regarding this product. Overall, I was extremely satisfied with the use of this product. It provided me with options that could have never been accomplished while using crutches on my non weight bearing protocol. I would not recommend this product if someone is dealing with a tiny living situation. But, for the use of covering long distances and situations which required a significant amount of standing. This product was excellent for serving to my needs as a patient, and serving as a crutch alternative.